Photo (From Web) Pibroch, AB, main street as it looked in 1951 when we arrived. During a trip to that area in 2010, the main street had not changed all that much. After bidding a final farewell his youth, the years used up toiling away on a rock farm near Birch Lake, Saskatchewan, Dad was being drawn back to farming. In the spring he had taken over as foreman on the Murfitt spread in Pibroch, Alberta, a mixed farm with 200 head of cattle and about half the 640 acres under cultivation. It provided an opportunity to reconnect to animals and the land. While horses had given way to tractors during the intervening years, Dad still had plenty of farming skills that made his services eagerly sought after and, as well, Mom would again be working in unison Dad. Taking over the farm kitchen she would work her magic as she cooked for a half dozen full-time farmhands in the off-season and twice that many during the harvest. For Louise and me, it would be a new school and new friends, something we were becoming accustomed to as we shifted from pillar to post over the past two years. The great news about this move – Louise and I would be reunited with Mom and Dad in a country setting that was reminiscent of our early years. Our time at HA Gray and the big city was rapidly coming to an end as we would be heading North as soon as the school year was complete. Packing our worldly belongings did not take long as our household furnishings from Marie Lake were still in storage at Cold Lake. It made little difference as the farm home into which we were moving was fully furnished, so all we needed were the clothes on our back and a few personal items. Mom, the sentimental soul she was, undoubtedly missed the knickknacks she had collected over the years, but such was the life of a gypsy family. Everything we were taking would fit into three or four large cardboard boxes and a couple of old suitcases. At one point I had hoped to be reunited with my dual wheeled wagon, but that would have to wait until another time and place. While Pibroch was only 60 miles North of Edmonton, I do not recall how we traveled. I don’t think we had a car at the time, as in Edmonton we always used the bus or a trolley when not travelling with Uncle Allan and Aunt Marcia or Uncle Clifford and Aunt Jean. 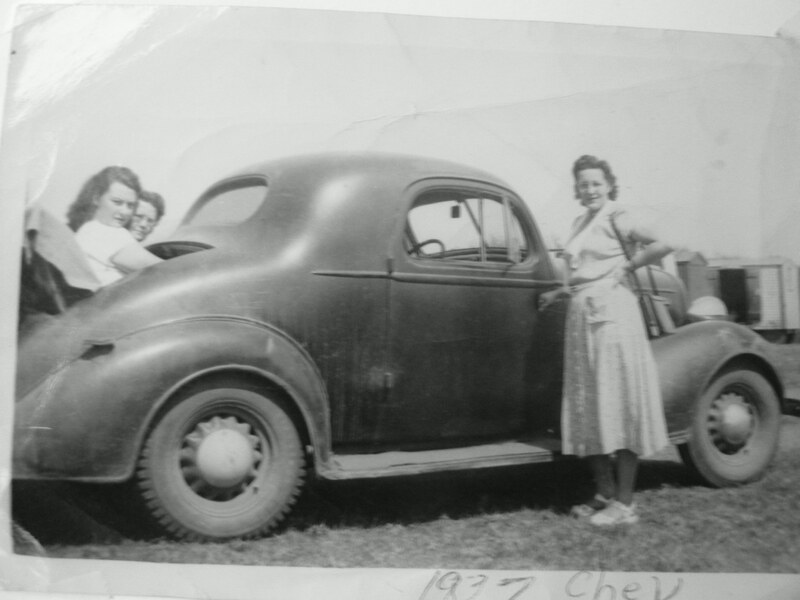 The first family car I recall was a 1937 Chevrolet Coupe (left), which was purchased a few years after we returned to Cold Lake, likely around 1956. Mom was working as a cook at the Cold Lake Air Base and because she had various shifts, purchased the car so she could get back and forth. It was not as difficult for Dad as he worked a regular 8-4 shift and rides were easy to come by. However, we travelled, the house into which we were to move was still occupied by the people leaving, so Mom, Louise and I moved into a second-floor loft above an old store on the main street in the town of Pibroch. Even by small town standards of the 1950’s, Pibroch was a poor second cousin. 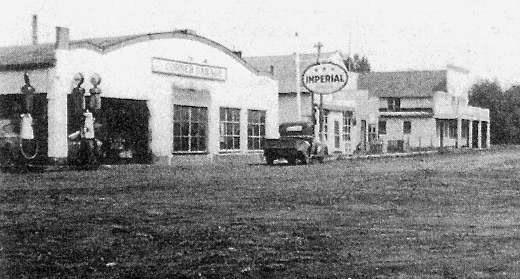 The main street held perhaps a half dozen businesses including a service station and the store over which we would live (photo above). Beyond that there were fifteen or twenty small homes, a one-room school, a church all of which was surrounded thousands of acres of rich farmland. After seeing us settled in, Dad went straight to the farm (about 2 miles further north) to begin work. He worked there regularly during the spring and decided it was more convenient to stay in the bunkhouse with the other farm hands rather than travelling back and forth each day. Mom, Louise and I would never forget the couple of weeks we lived in that, creaking, cavernous old building. It was cold and lonely at night and scorching hot during the day. Built in the style of a barn with loft, we lived in the loft. The roof and walls were covered with unpainted, aging shiplap with the only light coming from two windows that faced the main street. Perhaps a few days work would remove most the cobwebs, dust and grime from the windows, wall’s and ceiling, but the other detritus of age would stay until the building finally collapsed. About half the loft was used to store supplies for the store below with only a small section at the front (facing the street) cleared as living space. It was furnished with a couple of beds, table, chairs, stove and a few cupboards. There was nothing homey about the place and I doubt even mom, whose ability to turn a pig’s ear into a silk purse, could have turned the place around. Our first night was totally spooky as the windows along the front allowed the moon to cast moving shadows across the floor and walls as it played hopscotch with the clouds. The soft sounds of scurrying feet began as soon as the lights went. It seems the long-term, permanent residents of the loft had begun their nightly search for food. After hearing those sounds, mixed with the groaning of the building, our heads quickly slipped under the covers as we knew for certain those little feet would soon scurry across our beds and who knows what would happen if we fell asleep and our mouths fell open. The next day, Mom set several traps, then carefully put everything edible in metal containers to keep those little critters from carting away chunks of food for their own families. The result of all this strangeness was that on most nights Louise and I ended up climbing into bed with Mom just so we could get to sleep. Honestly, I think Mom appreciated the company. Everything settled down until a few nights later when we were hit by the loudest, meanest thunderstorm any of us could remember. It started sometime around midnight after we had all been sleeping soundly for a few hours when the rumble of distant, rolling thunder nudged Mom awake. A few minutes later as the lightning and thunder intensified and the wind began to pick up, Louise and I awoke. The storm then stalled right over the town. As the minutes ticked by it grew in intensity until suddenly an extremely bright flash of lightning lit up the inside of the loft. This was followed split second later by the crash of thunder that shook the store to its very foundation. Mom, who was usually pretty calm (at least in front of us kids), was clearly frightened. I am certain she felt the next lightning strike would destroy the building or set it on fire. There was not a thing we could do except hold on to each other and pray it would soon end. After what seemed an eternity, the storm abated and we finally drifted back to an uneasy sleep. The next morning we awoke to a bright sunny sky with everything smelling fresh even in that dingy loft. It was as if that storm had all been a bad dream, but soon as we stepped onto the street we knew we had not been dreaming. From one end of town to the other, the street was covered with torn and broken limbs, signs and garbage everywhere. There were even a few broken windows. 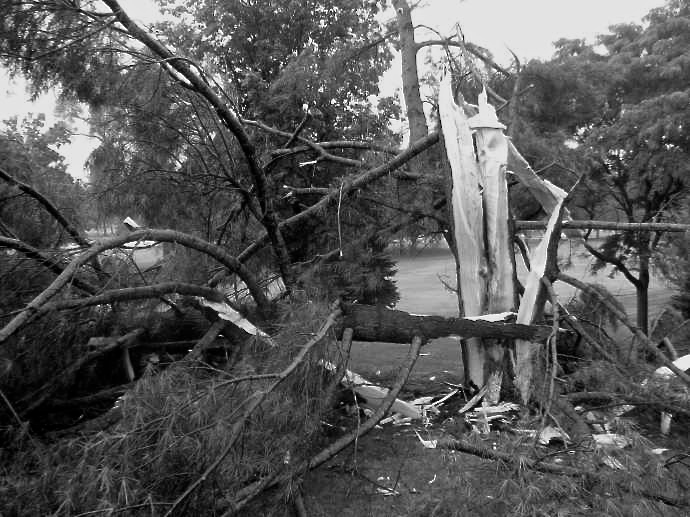 Not more than a half block west of our loft, a large tree had been shattered by a lightning strike. The tree was gutted right to the ground as appears in this photo (Web Shot). We had all heard of what happens when lightning strikes a tree but had never seen the result. It was brutal. The strike that killed that poor tree was likely the same strike we thought might end our world. In retrospect, it seems a tornado may have touched down in the area. Whatever it was we survived, but our troubles had not ended. Not many days later, Louise and I came down with one of the most common childhood diseases of the day – chickenpox. Most cases ran the course without medical intervention and my case was rather mild, but Louise was covered from head to toe with mean looking red splotches. When she started to heal, those splotches itched like all get out and one of the challenges was to avoid scratching. If a scab was picked off before it fully healed, it could leave a scar. Mom gave us regular baths in a mix of warm water and cornstarch, sometimes mixed with oatmeal, but beyond that, there was not much she could do (Vaccines and the Good old Days). Eventually, most of the splotches crusted over and fell off without leaving a mark, however, I could not resist picking just one. Check the faint scar over the centre of my baby sister’s nose at the bridge (Link). Over the two weeks we lived in town we settled in and even made a few friends, kids we would be going to school with, in September. Then, after the other people at the farm had moved out, we move in and Mom whipped it into shape. I suppose we had become a bit spoiled while in Edmonton as here there was no indoor plumbing so it was off the outhouse even on those frigid winters days. Also, for our weekly bath, it was back into a metal tub with water heated on the stove. Only one person got the fresh water. Ah, nothing like getting back to basics. The owners of the farm were pioneers in the Pibrock area and although the land was extremely rich and produced excellent grain crops, cattle still provided income stability and year-round work. Dad was experienced with both so soon had things humming. He was well liked by the owner and farm hands and Mom, of course, soon had a dedicated following as she was an excellent cook, bread, and pastry maker. Photo: Harold, Bonnie, Louise, and Lynn. The Murfitt’s had two daughters, Bonnie, 11, and Lynn, 8. 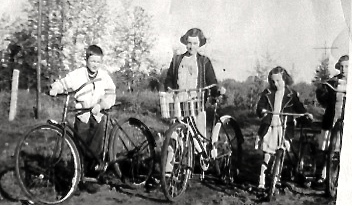 As we were on summer holidays, the four of us were soon playing and exploring to our heart’s content and with cattle, horses, haylofts, fields and bikes, there was plenty to keep us out of mischief. There was also the novelty of the telephone, the first I recalled seeing. It was a large rectangular affair, fastened the kitchen wall and the same line that connected to the outside world also included three or four other families. It was called a party line. The ring for each family on the one was in a morse code style (two long, one short or some combination of those rings). It was neat to be connected to cutting-edge technology. Another form of entertainment was the main line of the Northern Alberta Railway (now part of the CN) that ran by the front of the farm. The system linked Edmonton, Westlock, Pibroch, Dapp and points North and West to Slave Lake and Dawson Creek. Whenever we were near and a train rolled by, we would run over to wave at the engineer and crew. If we had a few pennies in our pockets when it was about to arrive, we would place them on a rail and let the train flatten them to the size of a quarter. It was great fun and did not cost much (see footnote re: 2010 trip to Pibroch). The one-room school in Pibroch was not unlike the one we attended in Harlan – one or two grades per row, but only five or six grades in all. I think the older kids went to High School in Westlock which was about seven miles south. It was a big change from H.A. Gray in Edmonton (link) as Louise and I were both starting Grade 3. We would be in the same row as there was still no suggestion that I might be moved up one or two Grades in order to catch up with my age group. Things went along well for the first couple of weeks as we made new friends and again became familiar with sharing a teacher with all those other grades. Then one day dad came to school and spoke with the teacher. 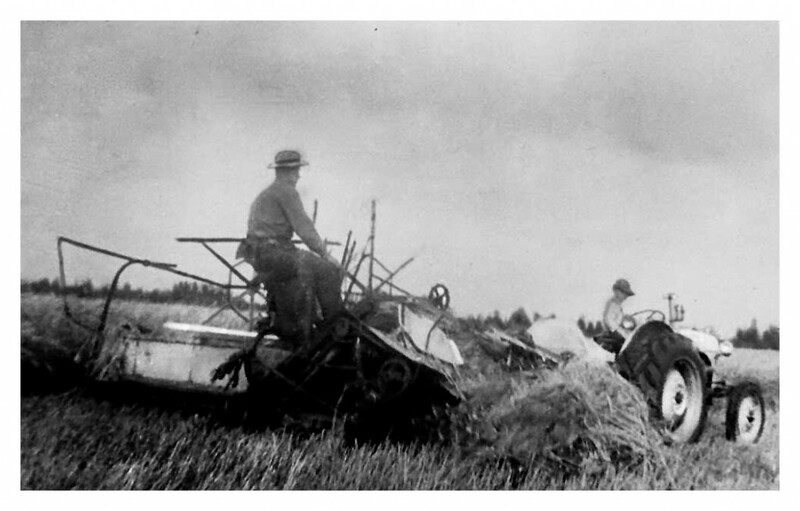 It seems they were short of seasonal workers to help with the harvest and Dad told the teacher (he never asked about things like this), he would be taking me out of school for a couple of weeks to drive one of the tractors. Photo (by Mom on her Brownie) Harold on the Fordson and Dad on the binder. This was not as unusual, as a lot of kids who lived on farms were often taken out of school in the fall the help with the harvest, although the fact that I was still in Grade 3 made it a bit out of the ordinary. Well, you would get no complaints from me as it was a dream come true to be working with my Dad and the other farm hands. The next morning after the dew had melted away, I was on a little Fordson tractor pulling my dad around a very large field while he operated the binder. 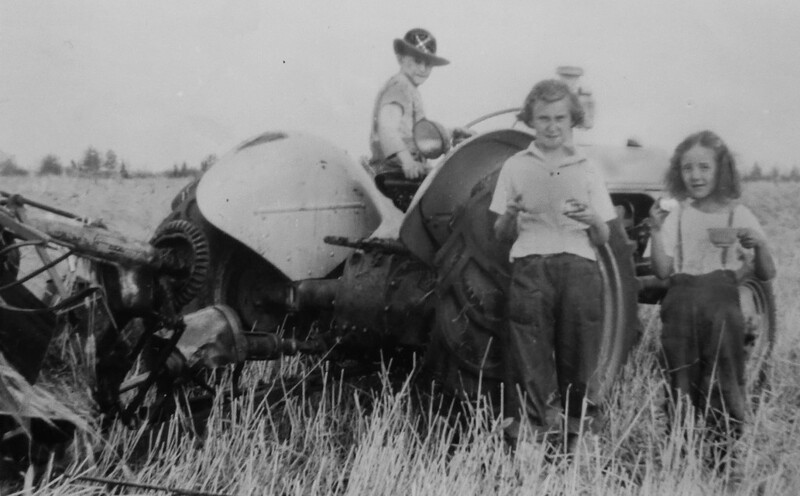 I was certainly able to handle the Fordson, but I had never pulled a binder so dad devised a few hand signals to help me along. The signs were simple. He used his fingers to indicate the gear (usually 1 or 2) and then a swipe across the throat to have me slow down slightly. To speed up he would simply raise his palm a few times. The fields were seldom clean rectangles as there were often clumps of trees or sloughs in various locations. At each corner or break point, a decision that had to be made as to which way to turn. If the turn was sharp, say 90 degrees or greater, we usually loop and circle back to catch the corner. It the turn was shallow, we might be able to round it off by turning a little wide to the left or right, then cutting back in. Over the course of a ten or twelve-hour day, turning the wrong way could eat up a lot of time so Dad usually made the initial decision using circular hand signals. One night Dad told me that he had to work on one of the tractors that had broken down so the other binder operator would be working with me. He said I was doing very good and would have no trouble. The next morning I was off to the field with a grisly older guy with a graying beard. He was friendly enough, but I was so worried I would make a mistake that I was nearly sick. The new guy seemed friendly enough but assumed I knew all I needed to know about pulling that binder around a field. The first time I came to a fairly heavy spot of grain and geared down, he thought it was not necessary so hollered: “What the hell are you doing? Keep going.” The day went downhill from there when I started making more mistakes (I didn’t think they were mistakes), but he seemed to think I was always going the wrong way on the corners. It was the longest day of my life. When I got home I broke down in tears as I told Mom what happened. She hugged me and told me not to worry, as I would likely be back with Dad the next day. When Dad arrived, he told me he was sorry and that he would not again send me out with someone a stranger. I slept soundly that night. A week or so later the harvest was complete and I was back in school. Man, schoolwork was simple compared to working those long days in the field. Perhaps that was one of the reasons I came to really enjoy school and study, well, at least until I hit my final couple of years in High School. Waiting with Bonnie was not difficult, for over the summer and fall I think I fell in love for the very first time in my life. Each time Bonnie would show up to see if we wanted to go play, my heart would flutter and I could feel my face flush. Photo: (by Mom). Lynn and Louise bring coffee and treats out to the field. Could it be I was mistaken on which girl was sweet on me? This was not something I ever told anyone particularly Bonnie, but just walking with her to and from school added a good measure joy to my life. I often wondered whether she felt the same stirrings and I actually think she might have as when she was not at school, she always took the opportunity to bring coffee and snacks to the field where Dad and I worked. None of the other tractors drivers received this special treatment from the owner’s daughter. When we headed back to school in January, our Mrs. McMaster, my teacher, sent home a note asking Mom and Dad to come in for a meeting. 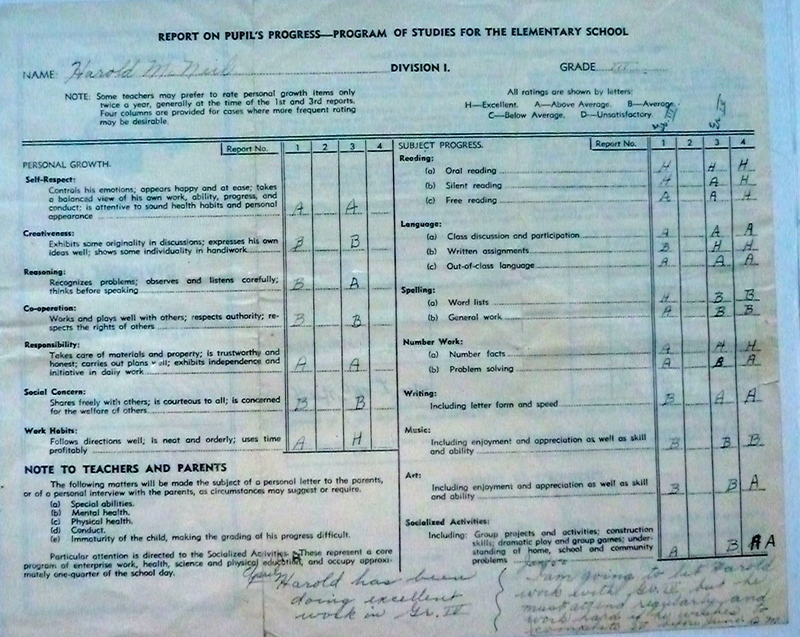 My first thought, based on the challenges in Grade 1, was: “Here we go again, I’ll be back in Grade 2 while sister moves on.” I wondered why all the mystery as I was doing well in Grade III with mostly H’s (Excellent) and A’s (Above Average) on my report card for the first half of the year (Link Here). “Holly cow! Someone finally gave consideration to what I was doing rather than what Grade I had ‘officially’ completed.” As far as attendance, on checking my report card I note I regularly attended in January and February (20 and 21 days), but something happened in March as I was present for only six days. I was absent for fifteen. I have no recollection as to why I had missed that many days. It seems likely I was sick, for if I had been pulled from school to work with Dad, I am sure I would have remembered. Following my return, I only missed a total of three days in April, May and June. Everything must have been OK at school and home as the rest of the year whizzed along. I had no problem completing the Grade IV and my marks continued at a high level in all subjects except spelling (B), which still causes me problems, and Music (B). Much of the credit for this success is due to Mom as she had done an excellent job of teaching Louise and me during those years we lived in the wilderness and, later, when we often struggled during the many moves to different schools. When I received my final report card for Grade IV, I was promoted to Grade V, but that grade would take place in yet another town where we would make new friends and get used to new teachers. Sometime in the early spring, a few men dressed in similar dark clothing appeared at the farm. I soon learned they were Hutterites from a Colony in southern Alberta that was forming a new division in Pibroch. They had purchased the entire Murfitt Farm. These men were the advance crew who would slowly take over during the spring and summer as they prepared for the arrival of the rest of families in late August. It seems our family would be on the move much sooner than we had expected. Among the crew of half dozen men was a 15-year-old boy who accompanied his father as part of the expansion crew. Over the weeks we became friends as the two of us sometimes worked together doing odd jobs around the farm. One day when the train was passing by I took him out to the tracks and showed him how we placed pennies on the rails. He was fascinated, not only by the flattening of the pennies but also by the fact that he had never seen a train before arriving in Pibroch. It seems there were no trains in the area of southern Alberta where he and his family lived. (Note: see footnote for an update to this story). As August slipped by Dad told us that we would be moving to Lac La Biche as he was again going into partnership on a mink ranch just outside that town. The gypsies were moving on. Sixty years slipped by until one day in 2010, our oldest son Jay and I, while on a trip to Alberta, dropped by to pay a visit to the Colony in Pibroch. I inquired if any members were there who may have been about 14 or 15 when the Colony took over in 1952. A few minutes later, a man, about my age introduced himself. He was the same man I met some sixty years earlier. Over apple pie and coffee, we talked about our lives and at one point the subject of the penny on the rail line came up. The man asked his wife if she still had that penny which he and I had flattened. Can you believe it, after all those years his wife still had that penny tucked away in a small keepsake box. The man went on to tell me another story about pennies that just happened a few months earlier. He and another member, both in their late seventies and both dressed in their black outfits, had been out driving and could hear a train coming just before they were about to cross the tracks at the farm entrance. The man told his friend about putting pennies on the rail, so they both found a penny, jumped out, placed them on the track, just as the train approached. The engineer, who had been had been watching the ‘old guys’ acting suspiciously, suddenly stopped the slow-moving train, got out, walked back to ask them what they were doing. Sheepishly the two old men told the Engineer they were flattening pennies. They all had a good laugh, the Engineer went back to his engine and the train pulled away. I asked to get a photo, but he declined to say he prefered not to have his photo taken. What a wonderful interlude after over sixty years. I was so happy to come across your website and stories of Pibroch via “google”. I was born in Westlock, Alberta and lived my whole life in Pibroch and very fond and happy memories. So glad you happened upon the blog story. I have sent you an follow-up email with a few questions. Your stories were great to read. I was raised a mile south of town and went to school there from about 1958 to 1964. My aunt worked in that old store you mentioned. The old town has changed since then, for sure. Great memories. Hi. So fun to find your blog. I remember going to school with you and Louise. I loved my childhood in Pibroch which incidentally was named by my grandfather Aaron Roddick. I will never forget the night the garage burned down. Nice to see the landmark photo before the big fire! Having just returned to the Okanagan Valley from a weekend in Pibroch, I am delighted to have stumbled on your blog to see the picture of the main street. My aunt and uncle Peggy & Gordon McGillvery owned and lived in the old Post Office on the North east corner of the main intersection and my brother Adrian currently lives south a bit backing on the School yard. We are Sheila’s cousins and still have a close connection to the town.